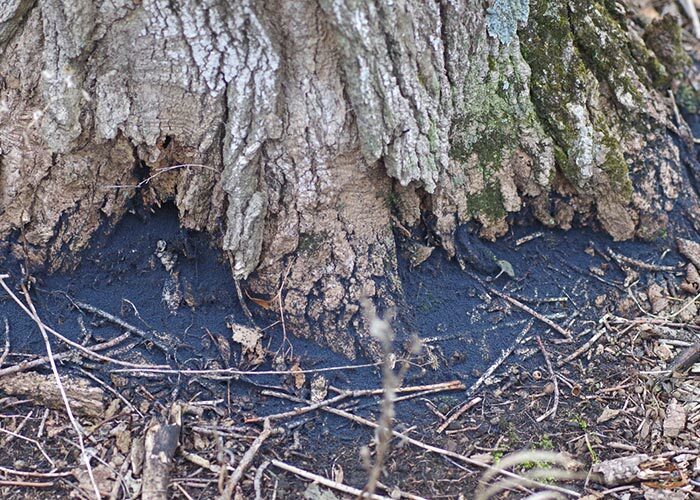 On March 11, as the BugLady walked through a nearby beech-maple woods, she noticed a blue-gray band, about three inches wide by twelve-plus inches long, at the bases and in crevices between the roots of a few sugar maple trunks. When she checked again three days later, it was still there, but with a layer of white specks over the top of the gray (no, not snow). Closer inspection showed a granular texture; an even closer look revealed small, linear shapes detaching themselves and leaping a few inches into the air. Springtails. 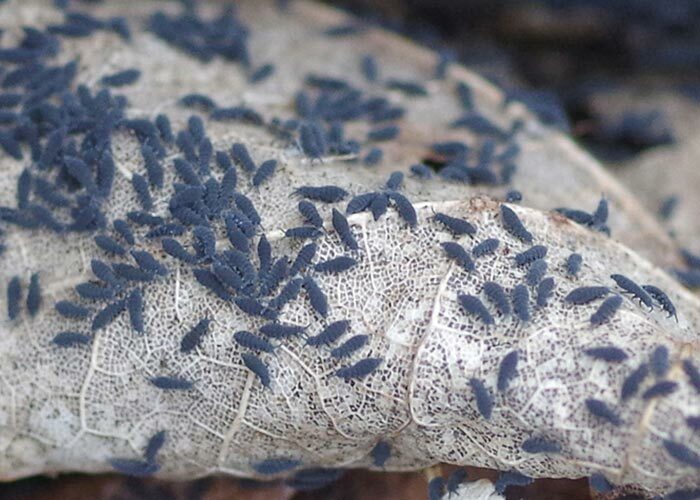 Then, springtails covered by a layer of shed skins. By March 20, they had moved on, leaving only the empties behind. Springtails are not insects, but they do have six legs, and older insect books list them as primitive, wingless insects. Most of the “for-public-consumption” Extension/Exterminator websites call them insects because it’s easier than explaining who they really are—members of the ancient class Collembola, which probably evolved alongside insects. There are springtail fossils dating back 400 million years (they don’t fossilize easily, but they sometimes show up in amber), and if they were insects, they’d be the oldest insect fossils known. They’re not fleas, though some are called “snow fleas” and “springtail flea” is a regional common name. They “spring” when alarmed, not for everyday locomotion. See previous BOTWs for an explanation of the name and the process (and other nuggets about springtail physiology), and do watch the dynamite video (note that when the video ends, there’s a Springtail 2 to click on). Springtail classification starts by ascertaining whether the critter has a furcula/furca (leaping appendage) or not. Springtail species that live deep in the soil don’t spring). 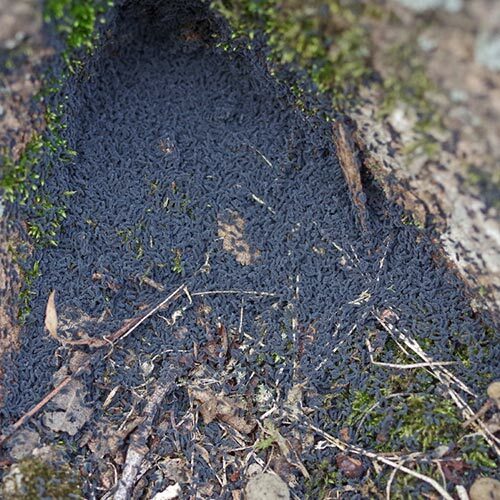 Experts guess that their mass movements may be a response to overpopulation (BugFan Mary was wondering if these springtails might have been responding to a sap leak). On a newly-thawed forest floor, a congregation may surface and crawl for a few days, covering twenty feet or so before disappearing under the wet leaves again. They are detritivores/microbivores/omnivores (though there are a few carnivores among the 8,200 species worldwide (700 or so in North America)). They feed on decaying plant and animal material, fungi, pollen, spores of mold and mildew, algae, etc. Like some primitive insects, they wear their mouthparts on the inside of their mouth (endognathous) rather than the outside (which makes it impossible for springtails to nibble on people, despite anecdotes to the contrary—more about that in a sec). 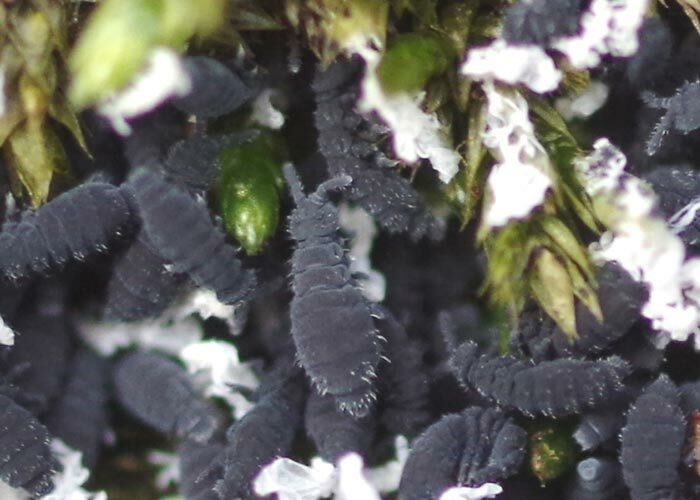 Springtails taste with specialized setae (hairs) at the tip of the antenna. They are fed upon by daddy longlegs, spiders, some beetles, and other small creatures of the forest floor, though some produce toxins to deter predators. Springtails are found on all seven continents, in moist places with leaf litter or soil (a few species have adapted to deserts, others to forest canopies, and still others prefer caves). They probably evolved in cooler climes, which explains their fondness for spring and fall, and they will migrate to damper microhabitats if theirs loses humidity. Although they are seldom seen (the BugLady famously finds them after the fact, in pictures of mosses and lichens that she’s editing), they are present year round in large numbers—300 million or more on per hectare (2 ½ acres) of good habitat and 100,000 per square meter. It is believed that springtails even outnumber ants. Many are between 1/16th and 1/8th inch long (think lower case “L” in a standard, readable font). 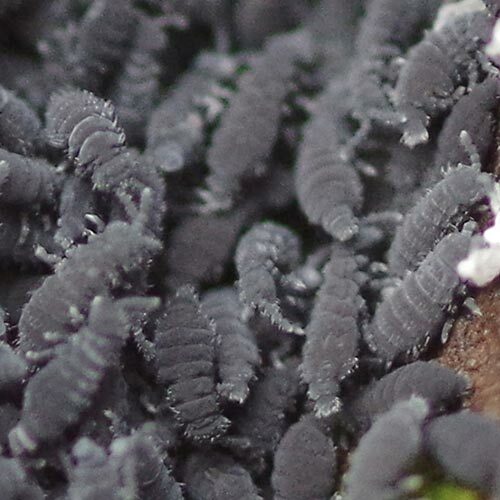 Springtails can be profoundly social, and they use aggregation pheromones to summon a crowd. If one springtail finds a good, damp spot, they’re all there. Their development is ametabolous—they just grow without changing shape or rearranging body structures and are adults at their fifth molt. Springtails continue to molt throughout their lives, and they’re most sensitive to desiccation while molting. 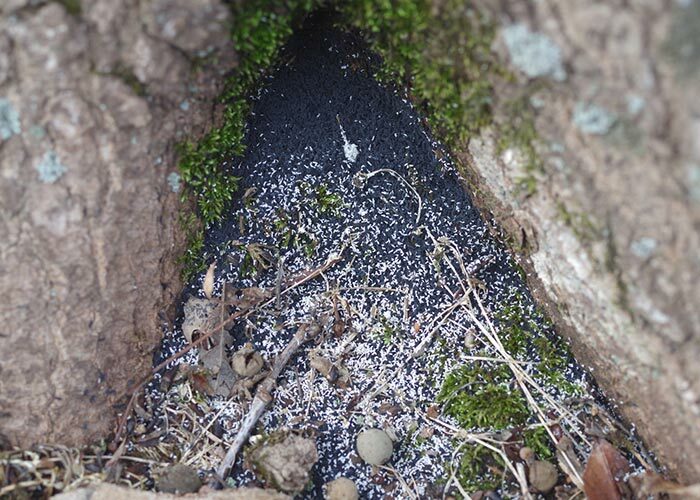 Their food habits contribute to soil enrichment—springtails help break down organic matter and make it more usable by other organisms. By feeding on bacteria and on the spores of many harmful fungi, they are said to help in controlling detrimental soil microbes. They are also big players in spreading the spores of mycorrhizal fungi, the fungal strands that form partnerships with plant roots and act as middlemen in nutrient exchange. And, of course, they poop—and die—and compost—on/in the soil. By the gazillion. When you Google “springtail,” most of the hits you come up with address springtails as pests. Springtails and agriculture: A few species are considered pests in gardens, nurseries, and in agriculture, especially in saturated soils (some like the tender, young roots of sugar beets), and they are impervious to a good many pesticides. Springtails in the home: Inexplicably, some people get the jitters when they see a mass of almost-microscopic bugs moving across the floor or up the wall. When people have a springtail presence in their house, it’s often an indicator of a bigger problem—moisture—lots of it—in walls, under sinks, in overwatered houseplants, etc. Exterminators’ advice: check for leaks and then turn on the dehumidifier. 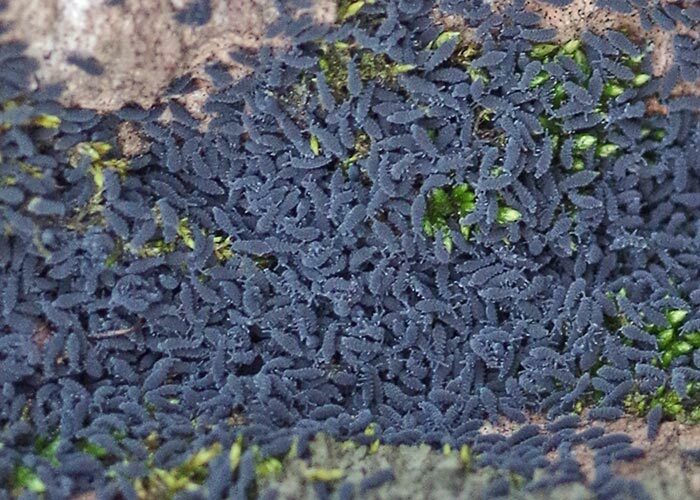 Springtails on your skin: Do they bite? Because “flea” is part of their name, it’s hard to convince people that springtails don’t bite. They don’t. But—some have hairy little bodies, and others produce defensive toxins, and they are ubiquitous. Advocates of the “Springtails Bug Humans” camp feel that dried springtail hairs/scales/bodies get on people’s skin and cause irritation, even indoors. They point to studies that claim to have found springtail parts in human skin samples/scrapings. The opposing “No They Don’t” camp has other names for this—“Morgellons Syndrome” (a fascinating topic, Google it) and “delusory parasitosis” (Ekbom’s syndrome). A third theory is that maybe the dampness that attracts springtails is growing something else that is causing itchy skin. Stay tuned. Final springtail note. In a bygone BOTW about sowbugs, the BugLady reported on the anecdote/urban myth about a show-off naturalist who demonstrated entomophagy (there’s a BOTW for that) by swallowing a sowbug in front of his horrified students. To his own dismay (according to lore), the sowbug never quite dropped into the pool of stomach acid and spent the next few hours trying to climb back out of his esophagus. On that note, Wikipedia reports on a scientist who was picking up springtails in a collecting jar called an aspirator (which works exactly like it sounds—some have a bulb, but many work on lung-power) and accidentally inhaled some springtail eggs—which lodged in his nasal cavity and hatched there, and “made him quite ill until they were flushed out” (do not try this at home). For even more about springtails, try Springtails by Kenneth Christiansen, by the Grand Old Man of springtails. By the way, the BugLady logged her first mosquito on March 12. The warming of water in spring issues a powerful summons.